In February 2005, my parents started the process of adopting a little boy from China. Finally, 15 months later, we have our appointment to get him. I will be going to China with my mom and my sister, Danielle, for 2 1/2 weeks to get him and bring him back to join our family. This little boy's name is Jiang Jian She and he is 5 1/2 years old. When he comes back to the US, his name will be Tyler JianShe Schutte. Everyone in our family is very excited and ready to have Tyler join us. On this page, I will be covering more about the trip and vacation than the adoption itself. 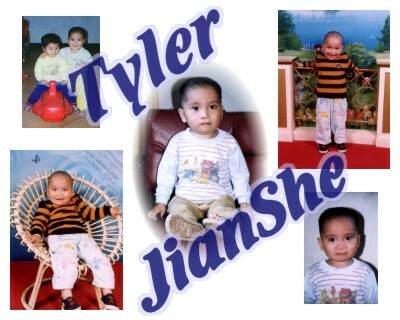 For more detailed information about Tyler and the adoption, see my mom's page about the adoption. I'd like to welcome you to come along with us by checking out this site every day for updates. We will be leaving for Beijing, China, in the afternoon of May 9th. From the time we leave the grond in Omaha until we touch ground in Beijing will be nearly 36 hours and we lose a day because of the time zone. I'm sure by the time we get there, we will be more than glad to be on solid ground again. When we first get to Beijing on May 11th, we will be met at the airport by a tour guide to take us to our hotel. The rest of the first day, we will be on our own. The next two days, we plan to tour Beijing. While in Beijing, we will get to see TianAnMen Square, Forbidden City, the Great Wall, the Summer Palace and hopefully a few more attractions. By the end of all of this and the jet lag - we should be good and tired, but we'll be having fun! The morning of May 14th, we will fly to Fuzhou, Fujian, the province that Tyler's orphanage is in. Tyler will join us on either May 14th or 15th. It will probably be on the 14th, what a wonderful Mother's Day present that will be for mom!! The next couple of days, at least, we will probably be staying in the hotel most of the time until Tyler gets used to us. Once we can start going out again, we'll see what there is to do. On May 20th or 21st, we plan on touring Anhei, Fujian. This is the city where Tyler's orphanage is actually located. Depending on the orphanage, we may or may not get to see the orphanage itself. We will fly to Guangzhou, Guangdong on May 22nd to finish getting all of the paperwork done to bring Tyler home. We will then take a train ride to Hong Kong on May 24th and leave Hong Kong to fly back to the US on the 25th. We will be back in Omaha late on May 25th and back home on the 26th. Day 13 & 14: Guangzhou, Shoppers beware!